The Photonic Materials group at AMOLF is looking for an intern at the Master level. We offer an experimental project where you can use an electron microscope to experimentally investigate the optical properties of a new class of photonic materials called hyperbolic materials (HM). You will build a theoretical model which allows to compare your experimental results with theory. In this way you will develop both your experimental, theoretical and numerical skills. The internship will take place in a particularly interdisciplinary and international environment. The experimental technique based on an electron micrope that you will use has been developed at AMOLF and is called angle-resolved cathodoluminescence (CL) spectroscopy. Visible light is created by exciting your sample with high-energy electrons (typically 500 eV – 100 keV). At AMOLF we use the high spatial resolution of a scanning electron microscope to study both optical and material properties at the nanometer scale; deep subwavelength! Individual grains in polycrystalline materials can then easily be addressed. In practice, optical and material characterization can be done by for example spectroscopy and angle-resolved cathodoluminescence , the latter providing us the angular emission pattern. Hyperbolic materials are birefringent. Birefringent materials have an anisotropic crystal structure that leads to a polarization and direction-dependent refractive index. From a geology and material science perspective, determining these different crystal orientations in a polycrystalline crystal at the level of individual grains would be valuable information for the understanding of material growth. As opposed to common birefringent materials, HMs show dielectric behaviour along one symmetry axis and metallic behaviour along another symmetry axis. These materials are also interesting from a nanophotonics perspective, since the simultaneous dielectric and metallic responses lead to special optical properties , for instance an infinite local density of optical states (LDOS) and beaming of light along the surface of a cone. HMs in the visible regime are rare to find in nature and are therefore often mimicked with a deep subwavelength periodic stack of metal and high-dielectric material. However, naturally occurring HMs do exist, two examples are graphite (hyperbolic for λ~250 nm) and magnesium diboride (MgB2, hyperbolic for λ~420 nm) . The first part of the Master thesis project will be dedicated to CL spectroscopy and angle-resolved CL on standard birefringent materials, like calcite. This allows to get acquainted with the technique and to construct and validate your model. In the second part, you will use the previously developed skills to study naturally occurring HMs. There is also a possibility to study hyperbolic metamaterials, i.e., materials that have been fabricated by means of clean room facilities that mimic the optical properties of hyperbolic materials. T. Coenen, E.J.R. Vesseur, and A. Polman, Angle-resolved cathodoluminescence spectroscopy, Appl. Phys. Lett. 99, 143103 (2011). A. Poddubny, I. Iorsh, P. Belov, and Y. Kivshar, Hyperbolic metamaterials, Nat. Photon. 7, 958-967 (2013). J. Sun, N.M. Litchinitser, and J. Zhou, Indefinite by nature: from ultraviolet to terahertz, ACS Photonics 1, 293-303 (2014). The Photonic Materials group, led by prof.dr. Albert Polman, studies light-matter interactions at the nanoscale. The group is composed of an international team of 8-10 PhD students, postdocs and masters students that work in a collaborative atmosphere with many social group activities. 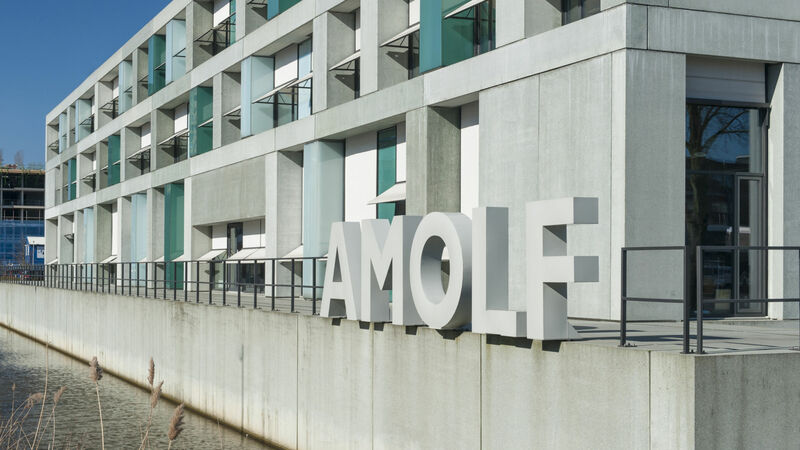 We are part of AMOLFs Center for Nanophotonics that is composed of 7 nanophotonics research groups (60 PhD students and postdocs) that share a cleanroom and many other facilities, and holds a weekly nanophotonics colloquium. See www.erbium.nl. You participate in a Master study in physics. You have a nationality of an EU-member state and / or you are a student at a Netherlands University. You must be available for at least 10 months.